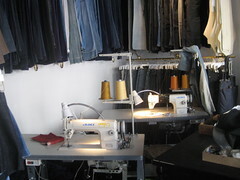 Greenpoint's "Garden Spot"--home to Heath Ledger's dangerously delicious Five Leaves restaurant and Van Leewan's creamery--just got even hipper: former Ralph Lauren denim designer, Loren Cronk, has converted an old storage space on Nassau Avenue into an elegant boutique and showroom, catering to selvedge enthusiasts and fit fanatics alike. Choices abound at various price points and style preference, from Loren's reasonably priced new mens' label, Soldier + Brave (with prices ranging from $69-$89), to the carefully considered custom collection, each featuring hand-numbered leather tags and unusual washes executed by hand in Loren's studio ($400-$600). A speciality silicon-based coating gives the custom denim a tough, almost crusty appearance, and requires nearly 8-hours of work just to apply. Though the boutique is only stocked with mens styles at the moment, womens pieces are on the way (keep an eye out for the "Melody" collection), as well as a range of unwashed, or "raw" mens' denim called BLKSMTH. Because the boutique doubles as a fully-operating design studio during the week, every inch of the space has a specific function--and occasionally, multiple functions. 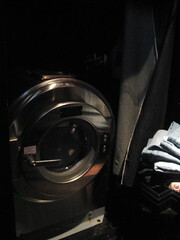 Denim connoiseurs will enjoy the giant submarine-salvaged stonewashing machines that are stacked, awesomely, in the dressing rooms. Visit Loren at 82 Nassau Ave, Greenpoint; Monday - Thursday (appt only) and Friday - Sunday (10am - 9pm).